On the occasion of the Berlinale 2019, Adobe is presenting a special edition on Monday, February 11th on the subject of film from its Adobe Live series of events. 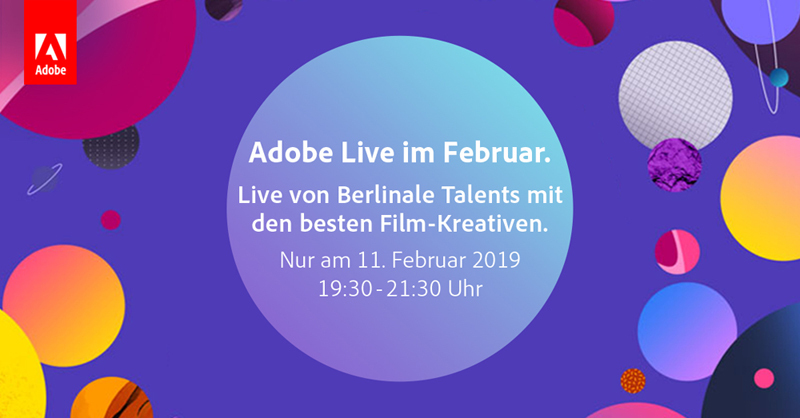 Between 19:30-21:30, editors Susan Korda and Konstantin Bock, among others, will give an insight into their work as part of the Berlinale Talents event for young filmmakers. The event will also be streamed live, so anyone can join in and ask questions - registration is not required, the stream can be viewed free of charge. Also the past Adobe Live events can be seen online all still here. The editor Susan Korda was already nominated for the Oscar. Now she shows us her Premiere CC professional tips and tricks. Konstantin Bock, editor of the Cannes award-winning film "Capharnaüm" and winner of the "Talent of the Year" award in Cannes, gives an insight into his work. Tim and Dennis from PROJEKT: ANTARKTIS talk about the wacky idea of making a feature film in Antarctica. Oscar nominated editor Susan Korda has been a frequent guest at the Berlinale in recent years. In her two-hour lecture "Kill your Darlings" at the Berlinale 2017, she spoke intensively about the art of film editing. The title is a quotation from the writer William Faulkner and refers to the quite painful realization that it is sometimes necessary to separate oneself from -- supposedly or actually -- particularly successful formulations or text passages or attitudes, because in the end they do not work in the overall context of the book or film.